Airplanes make use of parts such as propellers, turbine blades, and fans, which are powered by the combustion of fossil fuels or by battery packs that produce a persistent, whining buzz. However, engineers of Massachusetts Institute of Technology have recently developed a plane that are propelled by a silent but mighty flow of ions that is produced aboard the plane, and that generates enough thrust to propel the plane over a sustained, steady flight. The results in the journal Nature. "This is the first-ever sustained flight of a plane with no moving parts in the propulsion system," says Steven Barrett of MIT. "This has potentially opened new and unexplored possibilities for aircraft which are quieter, mechanically simpler, and do not emit combustion emissions." About nine years ago, Barrett started looking for ways to design a propulsion system for planes with no moving parts. He eventually came upon "ionic wind," also known as electroaerodynamic thrust -- a physical principle that was first identified in the 1920s and describes a wind, or thrust, that can be produced when a current is passed between a thin and a thick electrode. If enough voltage is applied, the air in between the electrodes can produce enough thrust to propel a small aircraft. 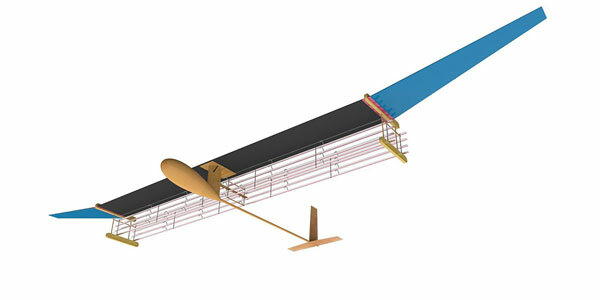 The team's final design resembles a large, lightweight glider. The aircraft, which weighs about 5 pounds and has a 5-meter wingspan, carries an array of thin wires, which are strung like horizontal fencing along and beneath the front end of the plane's wing. The wires act as positively charged electrodes, while similarly arranged thicker wires, running along the back end of the plane's wing, serve as negative electrodes. The fuselage of the plane holds a stack of lithium-polymer batteries, which supply electricity at 40,000 volts to positively charge the wires via a lightweight power converter. Once the wires are energized, they act to attract and strip away negatively charged electrons from the surrounding air molecules, like a giant magnet attracting iron filings. The air molecules that are left behind are newly ionized, and are in turn attracted to the negatively charged electrodes at the back of the plane. As the newly formed cloud of ions flows toward the negatively charged wires, each ion collides millions of times with other air molecules, creating a thrust that propels the aircraft forward.